A pellet stove is a wood fuel appliance that burns compressed saw dust (wood pellets) to heat homes, businesses, and greenhouses. Wood Pellet stoves have a hopper that stores pellets, then slowly feeds them into the burnpot where they are burned. As the pellets are burned, they are pushed into an ash pan for periodic emptying. Pellet stoves have multiple fans to extract the maximum amount of heat from the wood. The combustion blower tightly controls the air-fuel mixture for very efficient, nearly complete combustion. The wood fibers are burned so completely that cleaning the ash bin is weekly or even a monthly task. 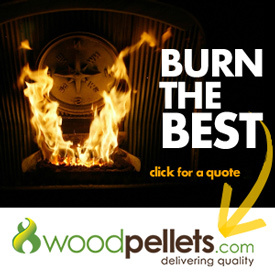 Some stoves with high quality pellets have been known to only need emptying of the ash pan with an entire ton of pellets burned. Pellet stoves also have a distribution fan, which pulls in cooler air from lower parts of the room through the stove’s heat exchanger and out the front of the stove. However, as stoves are a centrally located heating system, ceiling fans and other air movement helps pellet stoves maintain a fairly consistent temperature in the home or workplace. Compared to cord wood stoves, pellet stoves do not tend to have the same “hot room” feeling and may take a little longer to get the heated space up to temperature. Pellet stoves require electricity to run, so it may not a good choice as a primary heat source if you experience semi-regular power outages. Some models have a battery backup, but that is for a limited period. Small generators produce plenty of power to auto-start and keep a pellet stove running for a few days in case of power outages.